Kamari is a coastal village on the southeastern part of the Aegean island of Santorini, Greece, in the Cyclades archipelago with a population of approx. 1800 according to the 2001 census. It is part of the Municipality of Thira and is situated approximately 8 km away from the island's capital Fira. 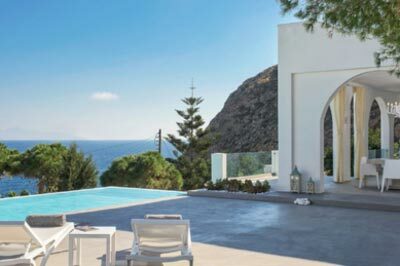 Kamari was built by residents of the nearby village of Episkopi Gonias, which was almost flattened by a devastating earthquake that hit Santorini in July 1956. The village got its name from a small arch (Greek: Καμάρα, Kamara) that still rises at the south end of its beach and is what remains from an ancient sanctuary dedicated to Poseidon. Today, it stretches along a beach covered with black pebbles, which is the longest of the island. The beach extends in a northeast to southwest direction from Monolithos to the feet of the Mesa vouno mountain that rises up to a height of approx. 400m, being Santorini's second highest peak. Once an agricultural and fishing village, modern Kamari boasts a thriving tourist industry, offering a wide choice of accommodation, restaurants, cafes, bars and night clubs, plus several water sport activities.